Yesterday I did my first batch of apple sauce. It seems to have turned out well. I'll be making some more later in the week. I'm looking at an All American 921 canner, then a bunch of other things can be canned. Someone asked earlier in this thread (or maybe another one) about reusable jar lids. Found some at Lehman's. Reviews look good. I may order some try out. I bought some at a show and have tried them. So far I have very good seals on the 1st use. The test will be reusing them again and again. Even though the regular lids are cheap, avalibility could be a serious problem in the future. I will be looking at some of those. On grocery store canned food, I have a small amount that is fairly old. Last week I pulled out a can of corn that was ten years old. Checked for leaks or rust, wiped off the dust and opened it. Looked at it, looked good, smelled good, tasted good. Made some delicious chilly. 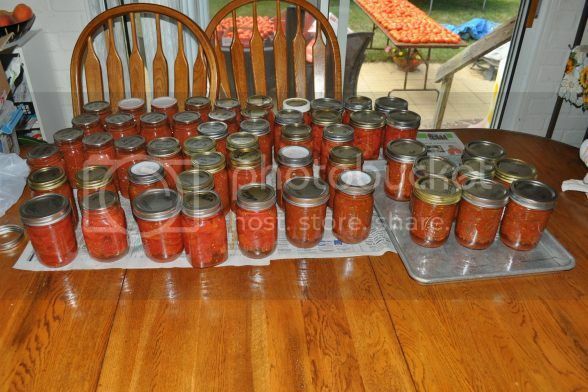 340 pint jars will fit under a queen size bed. Quarts if it's higher than mine. Last edited by J MOSBY; July 01, 2012 at 17:42. I'm just finishing up 4 bushels of green and wax beans. Now for the tomatoes and then the apples. Sounds tasty. One quick question, do you put your beans in pint or quart jars? I've been debating on doing some, but not sure what size jar I should use. I can only fit 7 quarts or 20 pints in my canner. However, it's more lids to can the pints, and more cost as more jars are needed (of course). So for shear volume, 20 pints makes sense as it's an extra 3 quarts per run, and the processing time is only 20 instead of 25 minutes, but it seems to take noticably longer for the pressure and temp to drop in the canner when done processing with pints instead of quarts (which makes sense with the higher volume of water.) Also, if I use wide mouthed jars (I usually don't but my wife bought some a while ago) I can not fit 20 pints in. With my family of five, a meal usually requires one quart and one pint, so I do about 14 pints and 14 quarts per bushell. Of course, it depends on if the bushell is generously packed by my local Amish farmers or not. I think a bushel normally yields 15 to 20 quarts. Thanks for the info. I'll probably end up doing a combination of both sizes then. That would probably be best/easiest since I have both size jars. 17 pints of applesauce today. I love applesauce. 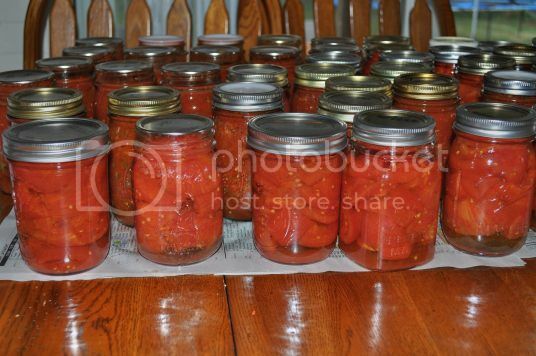 The last couple of weekends have been devoted to canning maters and salsa. We started with 4 bushels. A co-worker and his friend had a large garden (only 100 tomato plants ) and his friend moved to FL before harvest time, so my co-worker friend invited us over to pick a few. 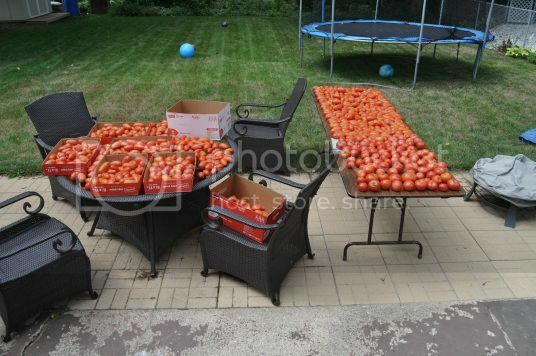 The majority are Roma's - quite large, with the rest being regular old round tomatoes. Forget the variety. I am trying some of the Tattler lids/rings on some of these (the ones with the white lids). Pulled my first batch of ripe tomatoes from the garden last week, about 30 lbs. Spent Saturday night and Sunday turning it into salsa. 40 pints total. Also spent time prepping veggies for the dehydrator. The family eats lots o' salsa, so will probably do another large batch like that, then the rest of the maters will end up as sauce and paste. I've canned some sweet pickled relish, mild and medium salsa, and some green tomato chow chow so far. I have a bunch of apples that are destined to be apple sauce and pie filling. If I don't have enough for pie filling, it will get made with the next apples that get picked.